This article was originally a guest published feature but we are now sharing on our blog as well. When we first arrived in India, a simple task of crossing a busy street seemed impossible. Freeways and roads are full of not only vehicles and pedestrians but also wild animals like pigs and the famous holy cows. The most convenient and exciting form of transportation in India is of course the “fast” and furious auto rickshaw. These little 3 wheelers can drive almost anywhere. In India, everyone and everything is moving in different directions and many times, insanely, against the flow of traffic. It's nuts and there are no rules, but somehow this functioning chaos works. One: Quickly stick out your hand towards the oncoming vehicle that might look like they will kill you, signaling, "stop mother f$*ckers, I am trying to get to the samosa stand across the street!" Two: When you see a small gap between moving cars you mustn’t hesitate. Continue with step one and go for it. Hopefully you'll make it and the samosa will be hot and delicious. Mission accomplished! Soon after we got comfortable with walking like locals, we discovered the fun of riding in a rickshaw. In fact, we had so much fun that we decided to buy and drive our own rickshaw. 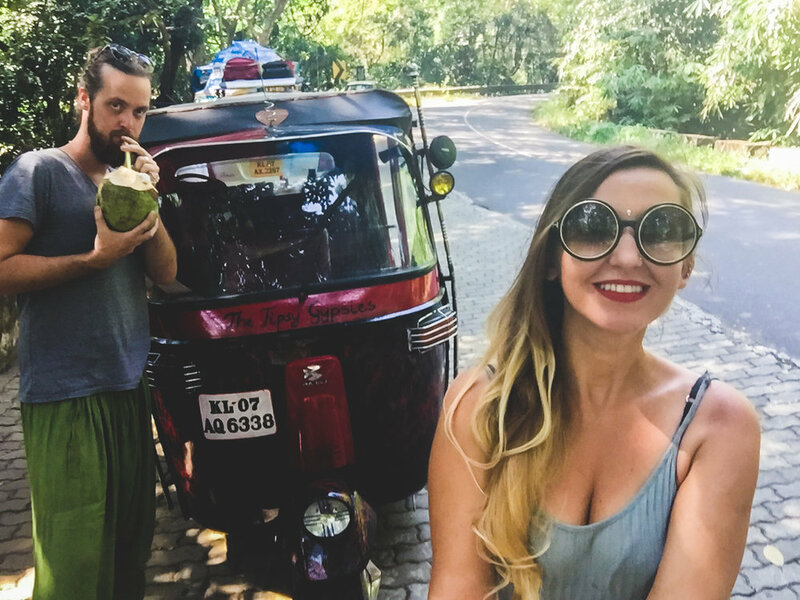 Yes, the idea was absolutely nuts but we wanted to try it and it sounded like a lot of fun doing a road trip across India in our own rickshaw. The only way you can understand what it’s like driving a rickshaw in India, is if you’ve ever played a car racing video game. The goal of the Rickshaw Game is to avoid various obstacles on the road such as humans, animals, vehicles, crater size potholes and giant rocks in the middle of the road etc. You do that to get from point A to B without hitting anybody or getting hit. You will never know when some object will suddenly try to “attack” you, so knowing the rules of the game is important. And the rules are, there are no rules! Constant honking helps to make the objects stay out of your way and therefor decrease your travel time and increase your chances of winning the game, aka reaching your destination. After a few months as passengers and studying professional rickshaw drivers, we decided we were ready to “take the controller”. We didn’t have a real plan, but we figured we would drive as far as we could and have fun along the way. We decided on a general direction and we started driving north from Kerala, towards Rajasthan. Our first day of the journey, we set an ambitious goal to drive about 150 km from Cochin to Munnar. This isn’t a long distance but the locals warned us about narrow and steep roads. We almost reconsidered but we felt strongly about driving to the most famous tea region in India. Rickshaws are known for easy breakdowns so after hearing about the treacherous roads we prepared ourselves mentally and hoped for the best. In the morning, right up until our departure we still didn't feel confident about our driving skills or how far we would make it. Starting our rickshaw was never easy, but on the morning of our launch, she purred to life right away telling us everything was going to be okay. Our first challenge was boarding a ferry. 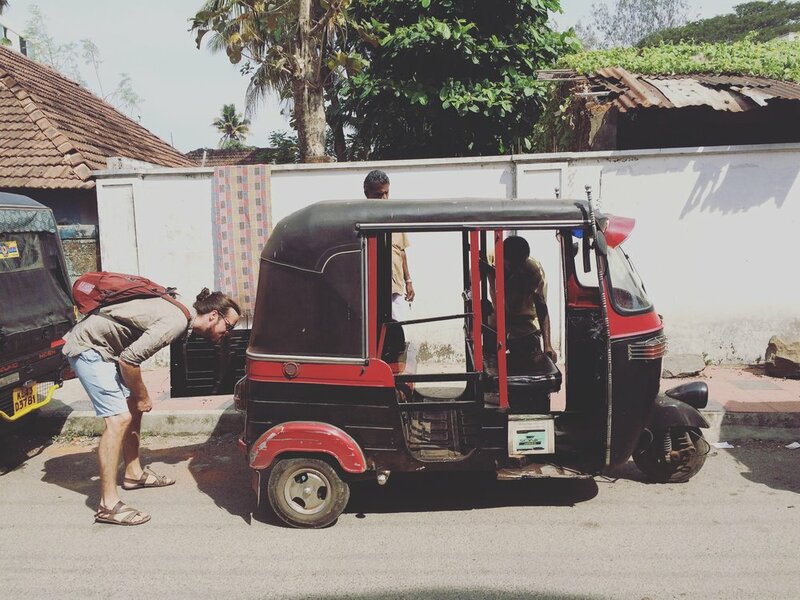 The ferry made you back on and getting our rickshaw into reverse wasn’t the easiest thing to do. The engine died a few time before we were able to board, which was extremely embarrassing because EVERYBODY kept starting at us. When Indians stare they have no shame and they won’t look away when you give them stink eye or try to stare back. There is even a term used here by tourists called ‘the Indian stare”. This was going to be something we would have to get used to while driving across India. Once we started driving it wasn’t so bad. One thing we wanted to avoid at all costs were major highways. (yes, highways exist in India). We decided to take the road suggested by our local friend but unfortunately we ended up on the biggest highway from Cochin to Munnar. The freeway was congested with big trucks and was not what we pictured as a fun road trip. We think our average speed must have been about 30-35km/h, but we can’t say for sure because the speedometer was broken. We also almost ran a red light on the biggest intersection on the freeway. In our 4 months of traveling in India we hadn’t seen any intersections with working lights or people obeying them until then. We knew something was wrong because all the cars were slowing down while we kept passing them. This caused severe hyperventilation and lots of cursing as we skidded to a stop in the nick of time. After a few hours, we finally veered off to a smaller, more picturesque road and we felt like we were finally on a road trip. We stopped consistently every 50 km, making sure we didn't overheat the old engine and also every time we saw fresh coconuts or cold beers (a privilege for passengers only). As we approached the mountains, the views got more beautiful but the roads began to rise and our little rickshaw had to work a lot harder. Our poor rickshaw moaned and cursed as we constantly grinded the gears on the climb up. We even stalled a few times. And let us tell you, it is not easy to get a fully loaded rickshaw with an engine the size of a lawn mower moving again from a complete stand still on a 45 degree incline. Most of the time we had to roll down to the bottom of the hill and try again. About 20km from our destination, while driving up a big hill the engine started making a terrible sound, and even after switching it off and taking the key out it wouldn’t stop screaming. We started to panic thinking it might catch on fire or worse. We took our backpacks out of the back as fast as we could, hoping that the whole thing wouldn’t explode. Luckily, the engine finally died and we rolled it to a safe spot. It turned out that we were driving on a nearly empty tank and the clutch was somehow temporarily jammed and after the engine cooled off, we refilled it and continued our journey towards Munnar. The few times we passed any police on the side of the road, by the time they realized that two tourists were driving past them in a crazy painted rickshaw it was too late for them to stop us. We just waved and hoped they were not able to chase us. Finally after a full day of driving, we reached Munnar without any serious mechanical issues. The weather was much cooler since we were at a higher altitude and after finding a cheap hotel and eating some amazing street food, we were tired and ready for a cold beer and bed. To read the rest of our story you can continue the journey here!